Considering I pay them to read their dreck in the environmentally friendly but hopelessly useless digital edition on my iPad, you would think when I call nicely and ask them not to toss their trash in my yard, of ads- I already skip when reading their rag (hint to advertisers, there are very few reasons to advertise in newsprint anymore- if you need help with advertising- try my agency). There is a very long thread on NextDoor.com (membership required to view link) with people discussing ways to stop the littering, including legal action. So this Christmas, George (my dog) and I decided to take an Ikea bag and fill it with their trash and share the season with the folks at Cox- in their HQ on S. Main Street. Watch and enjoy- and share as much as possible. 9:30 pm Apparently some entire neighborhoods have been able to opt out. 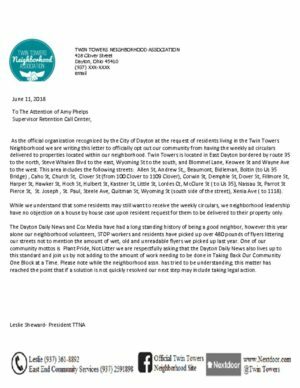 Just have your neighborhood association send a letter to [email protected] (update 22 Feb 2019 [email protected]) The letter has to be on the neighborhood assn letterhead. She needs a list of all the streets in your neighborhood and voila. This is how Twin Towers opted out- after they took over 100lbs of trash and dumped it in the DDN Lobby! Vandalia banned “unsolicited advertising” being distributed by restricting where it could be placed. Here’s a copy of their letter. 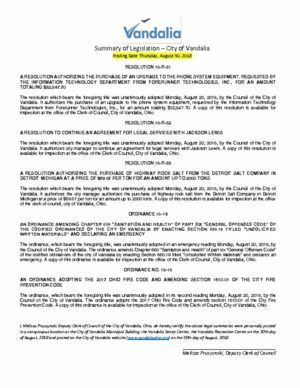 And here is the Vandalia ordinance banning unsolicited advertising. Perfect! Thanks for all you do for Dayton. The trash stopped when I complained, but I’m sure DDN will see my comment and put me back on the list. Good video, Dave! The dog really should have gotten top billing, though. This may be ny favorite Esrati post. I hate this litter. It ends up getting mangled in the street and stays there for weeks. Hopefully Melissa from Belmont gets this removed from our neighborhood. We had a guy in our area that contacted the DDN and included the ORC regarding littering. Also copied someone in the Sheriff’s office on the letters. Took a couple of tries, but he finally got them to stop. I think that enough people dropping wet bags of ads in the DDN lobby will make them get the message. Would be a lot of fun to take the stuff out of the bags and leave it loose in the lobby… just to add to their work of picking it up. LOL!